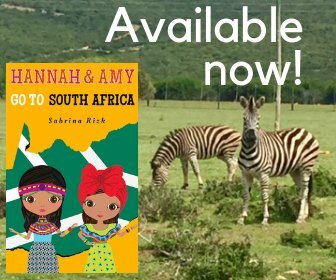 Day 1 of our Round the World Family Adventure! 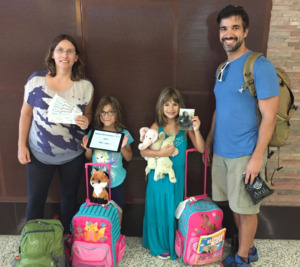 From September 1, 2015 to March 1, 2016, our family traveled through 10 countries on five continents over a period of six months. One of the biggest concerns parents have about traveling with kids, is how to stay healthy, particularly in lesser developed countries. Although I shared these concerns, I did not want them to stop us from traveling. I researched what we could do to stay healthy while traveling and prepared for health issues that may arise during our travels. 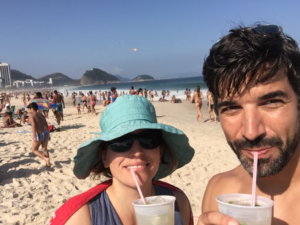 Before our trip, I spoke to our doctors to find out what we needed to do to stay healthy while traveling. We were referred to the Travel Clinic to find out more about what vaccinations and medications we may need for our trip. At our initial visit to the Travel Clinic, we informed the doctor of our travel plans. Once the doctor knows where and when you are going, s/he can advise you about what you about what vaccinations and medications you may need. Our Travel Clinic gave us a packet of information on the health risks and requirements in each country we were visiting and scheduled our vaccinations. Tip: Schedule a visit to the Travel Clinic 4-6 months prior your trip, as some vaccinations, like Hepatitis B, are given in a series of doses, with several weeks needed between each dose. We went to the Travel Clinic 4 1/2 months in advance of our trip. I also read the travelers health information from the Centers for Disease Control and Prevention (CDC) for each country we were visiting. This information is quite comprehensive and includes information specific to traveling with young children. 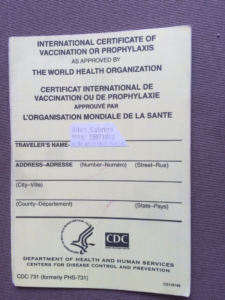 For our specific trip, we needed to be up to date on routine vaccinations, including the flu shot, and we needed the Yellow Fever (some countries won’t let you enter unless you can show proof of having the Yellow Fever vaccine), Typhoid, and Hepatitis A and B vaccines. We were also given medication for malaria, altitude sickness, and an antibiotic for travelers’ diarrhea. During my research on bringing prescription medication into foreign countries, I found out that in Australia travelers are only allowed to bring in a 3 month supply of medication. I packed what I could and arranged to have the rest mailed to us in Sydney. Lastly, I made sure we had family travel health insurance. With all these measures in place, I was fairly confident we would stay healthy while traveling. 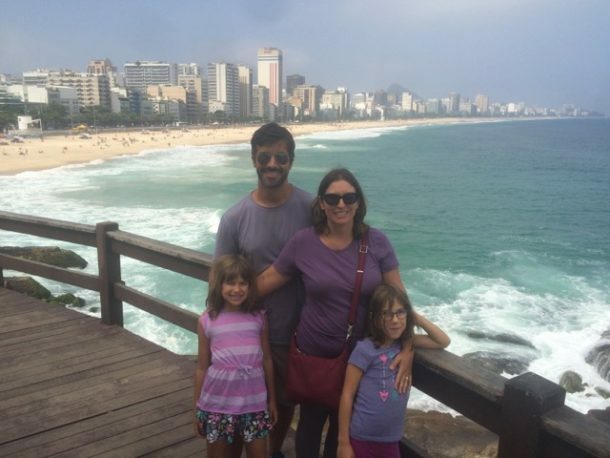 During our trip, we practiced several habits to help keep us healthy while traveling. For example, we carried hand sanitizer with us, and made sure to wash or sanitize our hands before eating and after using the bathroom. On overnight train rides, we had our own toilet paper, soap and a quick dry hand towel. I made sure we put on bug spray and sunscreen, as needed. Everyone stayed hydrated with bottled water in countries where the drinking water wasn’t safe to drink. We took our vitamins everyday and the malaria pills and altitude sickness pills as needed. My husband and I also took Melatonin at night to make sure we had a good night’s sleep and would be well rested the next day. In general, we followed the rule about eating well cooked foods, and only those fruits and vegetables you can peel. I tried my best to ensure the girls were eating a variety of foods from all the food groups. 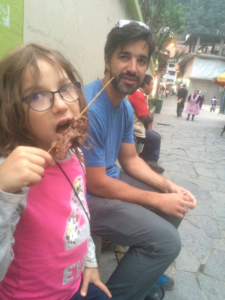 We did take some liberties by eating food from street vendors in Peru, Brazil, Malaysia and Thailand. We also had drinks from vendors in Brazil, Thailand and India. Anthony suspects it was the glass that did him in as the rest of us had straws. 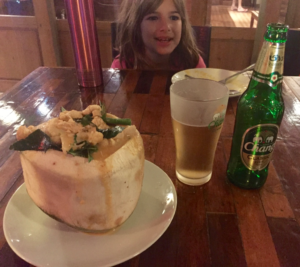 My husband ended up getting a 24 hour stomach bug in Thailand, but it was from a tourist restaurant in Chiang Mai, and not the street food in Bangkok. As for our first aid kit, we used it mainly for the bandaids and ointments for insect bites. My eldest would not stop picking at her bug bites, so they were constantly bleeding. We actually had to buy more boxes of bandaids on the trip, which were fairly easy to find. We also had to buy more multivitamins in Italy, because I got the math wrong on that one! The letter from our doctor about my daughter’s prescription also came in handy when my husband left his bag on the train in Italy, and wasn’t able to recover it. It had our daughter’s prescription medication in it, but we were able to get it refilled easily, (and cheaply) because we had the letter with us. Once we returned home, we were seen by our doctors to ensure everyone was healthy. We kept an eye on my daughter’s bug bites to ensure they didn’t get infected. We continued our daily routine of taking multivitamins and the girls continued taking their fluoride tablets (our water is not fluoridated). Six months after our trip, everyone was still healthy and the bug bites did not get infected. It actually still amazes me how little health issues we had on our trip. I hope the same will be true of other families who decide to travel! Let me know how your family stays healthy while traveling in the comment box below.